Understanding Korean Drinks: What Is Makkoli? With this review of makkoli, including its contents and origins, develop an appreciation for the beverage and consider trying it yourself. Makkoli has the distinction of being the oldest alcoholic beverage in Korea. It dates back to the 10th century during the Koryo dynasty. Despite its ancient origins, makkoli has, until very recently, had the perception of being the Korean equivalent of moonshine. One of its unofficial names is nongju, which refers to its peasant roots since "nong" means farmer, and " ju" means drink. For years, people associated makkoli with the elderly or the types of rural people known as hillbillies in the United States. 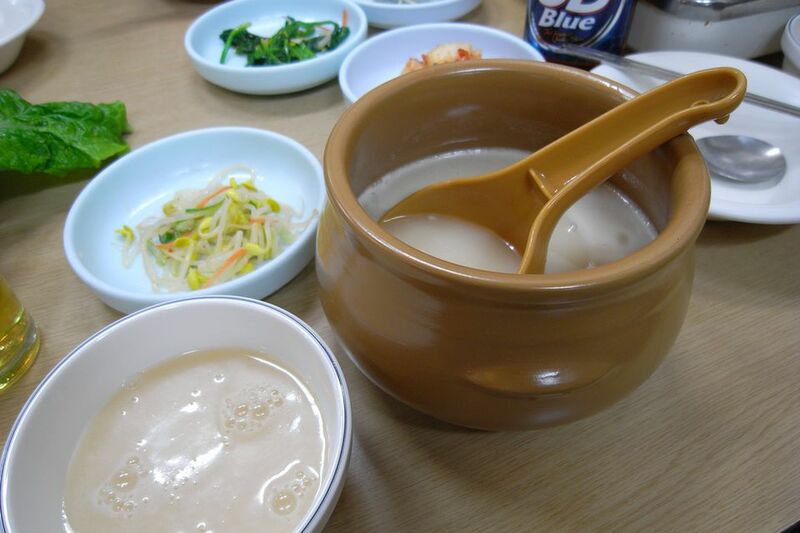 Makkoli has resurfaced as a popular drink in Korea because people there are extremely interested in any drink or food thought to be good for one's health or well-being. Given the popularity of health trends in Korea, it's no surprise that makkoli has become a sought-after drink again in the 21st century. Certainly, before long, Americans and others in the West will jump on the bandwagon as well. This goes double for U.S. cities with large Korean American populations, such as Los Angeles. So, what makes makkoli stand out? For starters, the drink is made from a mixture of fermented rice, wheat, and water. It is unfiltered (unlike soju and sake), so it contains lactic acid and some of the good bacteria found in yogurt. That means it may aid in the digestive process. Makkoli also has fiber, vitamins, and only a 6 to 8 percent alcoholic content. To compare, wine has a 10 to 20 percent alcohol content, and soju, another popular Korean drink, has 20 to 40 percent. The low alcoholic content of makkoli, along with its health benefits, makes it a great drink for people who aren't super interested in alcohol. If possible, try makkoli for the first time with someone who's tried it before and can tell you what to expect. If no one you know fits this bill, ask the bartender or server for tips. Makkoli has a mild and slightly tangy flavor that makes it perfectly paired with flavor-bursting Korean meals. Even though it has become trendy, and fancier bottles, brands, and flavors have come on the market, it's still extremely cheap and suited to making mixed drinks. When served plain, makkoli is poured into small bowls so that the liquid can be stirred and no sediment falls to the bottom. What Is Korean Rice Liquor, Soju? Check out These Yummy Korean Breakfasts! What Kind of Fruit Is a Bae? Looking for Korean Food in Kuala Lampur? What Do Koreans Eat For Breakfast? What Is an Easy Korean Dinner Party Menu?